Create mental space through meditation. Come join a 30-minute meditation session — appropriate for beginners and experienced practitioners — that will introduce meditation techniques based on the vipassana, or insight, tradition, and the practice of mindfulness. Scientific studies have shown that meditation can increase concentration, help manage difficult emotions, improve a sense of calm and well-being, and decrease stress and anxiety. Our guided meditation will take participants through a process of relaxation, body scans, single-pointed breath focus to be grounded in the moment-to-moment experience. This class is led by Laura Trejo, a 500-hour Yoga Alliance registered teacher trained in vinyasa yoga, a NASM-certified personal trainer, a mat pilates teacher, a black belt in tae kwon do, and a reiki practitioner who trained at the Center for Integrative Medicine. “If you can go to the gym to strengthen your body, why not meditate to strengthen your mindfulness muscle? I guide the class in mindfulness meditation after having meditation practitioners do a progressive relaxation exercise. I ask students to focus on their breath as a tool of the meditation. However, the actual meditation practice happens when a practitioner notices, without judgment, that they have become distracted by their thoughts and they can return the focus to the breath whenever they are ready. 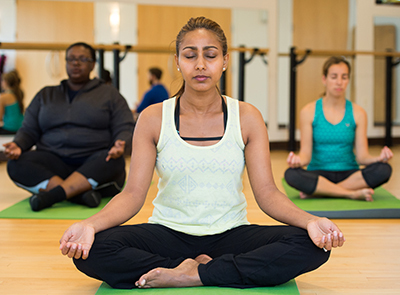 Unlimited meditation classes are included with MINT class-access memberships. You may also attend via our a la carte program. Blankets and chairs will be provided, but feel free to bring cushions or pillows to support your sitting posture.